Tarrago, J.; Rizki, Z.; Scheider, S.; Llanes, L.
Tarrago, J. [et al.]. Application of image processing and analysis techniques for microstructural characterization of cemented carbides. A: Euro PM Congress & Exhibition. 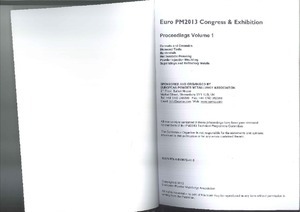 "Proceedings of Euro PM2013". Gothemburg: 2013, p. 135-140.